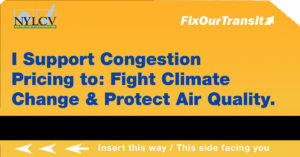 Albany, N.Y. – Does your Assemblymember or Senator support congestion pricing? How can you tell? Today, the New York League of Conservation Voters (NYLCV) made it easy for state legislators to show their support for congestion pricing on Facebook, Instagram and Twitter. 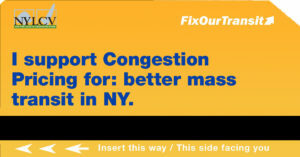 NYLCV released digital tools for Assemblymembers and Senators to let their constituents know they are fighting to include congestion pricing in this year’s budget. Earlier this month, NYLCV announced that congestion pricing will be a priority bill for its 2019 State Environmental Scorecard, the first time it will include a budget item in its rating of elected officials. These tools will be one of the ways that NYLCV will count legislators’ support for congestion pricing. Congestion pricing would impose a fee on vehicles entering the city during specific times in predetermined traffic-heavy areas such as Manhattan below 61st Street to reduce congestion, raise revenue to support improvements to the transit system, and cut air pollution and carbon emissions. The transportation sector is the number one source of greenhouse gas emissions in New York State. Air pollution from vehicles contributes to respiratory issues, especially asthma. At the same time, public transportation has been plagued by delays, signal failures, and crumbling infrastructure. Because of these failures, more New Yorkers decide to drive, making New York City the second most traffic-congested city in the world. Passing congestion pricing will improve transit reliability by providing funding for the MTA, while also reducing traffic, particulate matter pollution, and greenhouse gas emissions. Research shows that congestion pricing could decrease traffic congestion by 13% and prevent 2.1 billion pounds of greenhouse gas emissions per year in New York. That is equivalent to emissions from 740,000 passenger vehicles in one year or powering 600,000 homes. Furthermore, after congestion pricing was implemented in Stockholm, researchers found a 50% drop in childhood asthma rates and a 15% drop in particulate matter emissions. A public statement in support of congestion pricing. Statements to the press, on social media – including the newly released tools – or at a public event will be counted. Signing on to a Dear Colleague letter in support of congestion pricing or sending a letter to leadership. The New York League of Conservation Voters is the only non-partisan, statewide environmental organization in New York that takes a pragmatic approach to fighting for clean water, healthy air, renewable energy, and open space. For more information, visit www.nylcv.org.